When you hover your mouse cursor over the thumbnail, a vertical panel of instruments appears on the right. Here you can find “download” button among other instruments. Once you select an asset, you can find the “download” button on the left-side panel. When you click on “Preview” of the asset, you may see the “Download” button on the left-side panel. Can I download a number of files in one go? Sure. You can select a number of assets and download them together. You can learn more about mass downloading here. How can I save my assets in a different format? All file formats can be downloaded as original only. However, there are some files which can be saved in a different format. 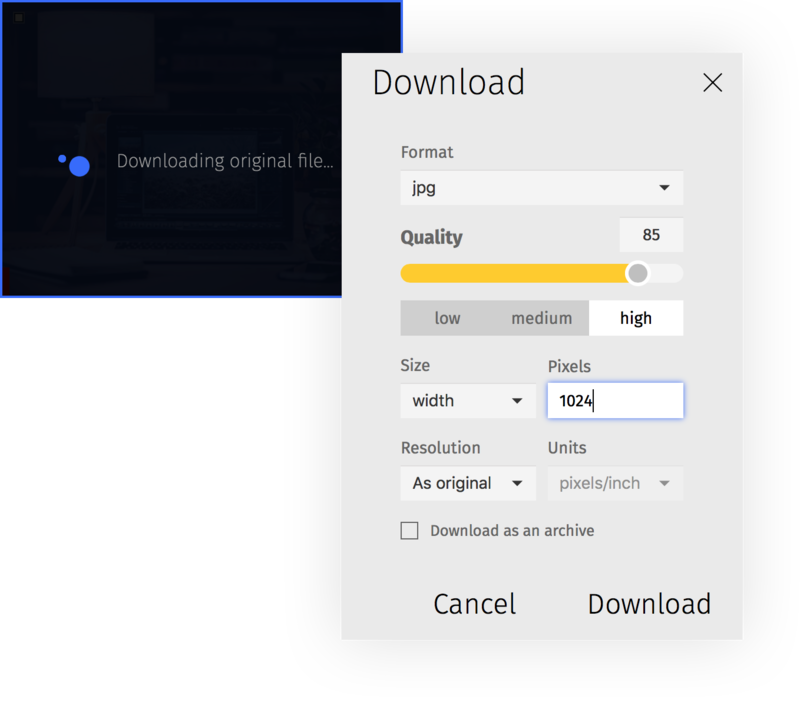 During download from Pics.io it is possible to convert RAW, PSD, JPG and PNG files to jpg/pdf/png formats. Moreover, when convert the formats, Pics.io allows you to resize your files. It means that you can change the quality of your asset. Moving the knob of the slider bar, you can choose the quality: Low, Medium or High. You can also update the size of your image in pixels and modify its resolution. You don’t have to worry about the actual size of your assets. Resizing your files as you download them does not affect their actual size or format that way they are stored in Pics.io. If you download multiple assets, you can choose either to download them as an archive or as separate files, depending on what is more convenient for you. How can I track the progress of downloading? Once you click on the “Download” button, the downloading process will start. A new icon of “Download list” will appear on the left-side panel. 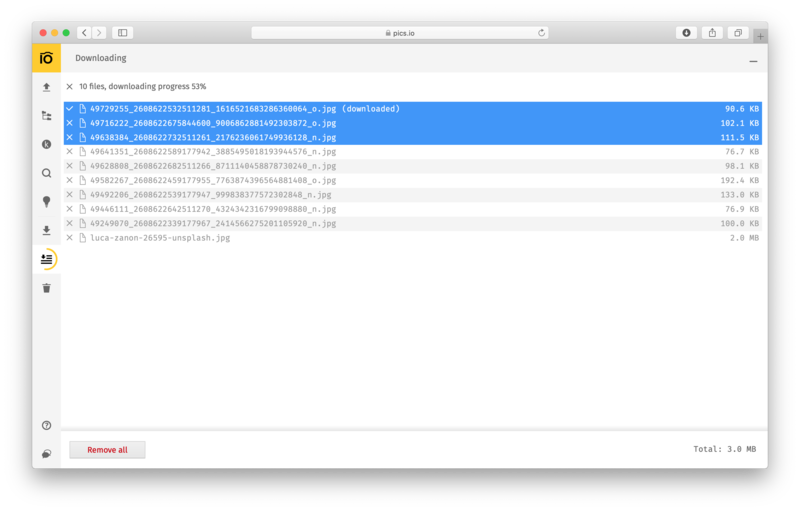 Here you can see the progress of downloading files from Pics.io to your device. It is also possible to collapse the Download window by clicking on the “Minimize” icon on the right-side top corner. 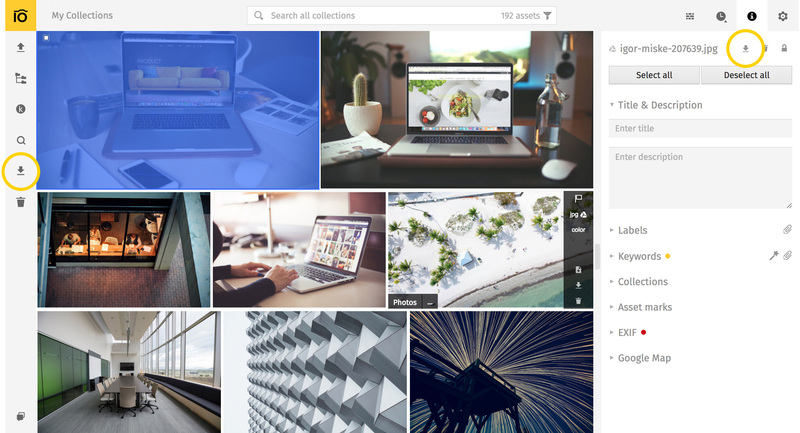 It will allow you to continue working with Pics.io while the necessary files are downloaded. Also, it is possible to remove unnecessary files from the Download list during the process. What if I have issues with downloading files from Pics.io? make sure there are no add-ons or plugins (like Adblock or uBlock) installed in your browser. While downloading files with large size, please do not use incognito mode, just download such assets via usual browser window. If the issue with downloading files still persists, please contact us via chat or at support@pics.io with more details for further investigation of the problem.